It's time to look at new ways of making an impact with your customers. 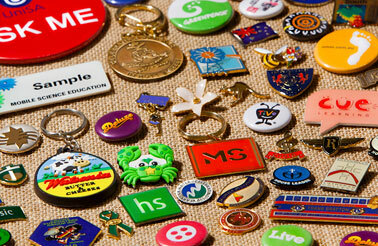 Why not spend a minit and see why over three decades of experience makes us leaders in badge creation. You name it we can create it! Button Badges - Steel componenets, artwork is printed onto paper stock covered with a clear mylar and pressed into the size required by one of our great team members. Name Badges - Predominately a plastic base with the logo/artwork & staff members names either digitally printed directly on to the surface or engraved, depending on your requirements. Metal Badges - These badges/pins are metal based, metals used range from Brass, Copper, Iron & Alloy mixes, your artwork will deem what process & metal should be used. Reuseable Name Badges - These up market badges are aluminum based with anodized effect, colours available are gold and silver. Make Your Own! Our button badge machines are simple to use and a sound investment. Earn a healthy profit with a professional product. We will help you choose the most appropriate machine from our range. If you're looking for effective marketing with cut through results, Badge-a-minit does it all. Let us show you how we can make our products work for you.